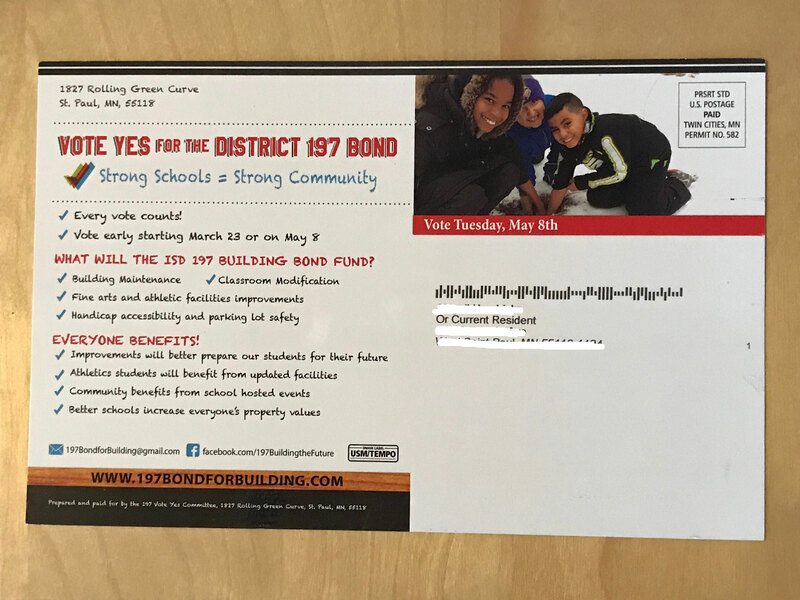 District 197 has an bond referendum on the ballot May 8. They’re asking for $117 million for additions, renovations, and repairs at all schools. So how much is this going to cost and what does it mean? Let’s take a look. How Much Will It Go Up? For a median value home ($237,200), your taxes will go up $87 per year, or $7 per month. Total 2017 school property taxes for a home valued at $200,000. The proposed bond will increase taxes on a home valued at $200,000 by $77 per year. On this chart, that would raise us to $819, and past Inver Grove Heights by a whopping $20. We’d still be well below most of our neighbors and other metro districts. It’s not a big increase. Modernizing the science wing that hasn’t been updated since the high school opened in 1971. Updating the kitchen education space from household-based home economics to real culinary arts. Close the Heritage pool and move aquatics to the high school. Not only does this solve an expensive repair issue and give Heritage new space, but it further consolidates sports at the high school. Creating accessible spaces and safer parking lots. I took a tour of the high school to see what changes they were talking about, and a lot of it is simply making better use of space. It’s allowing teachers to break classes out into groups and be able to see where kids are. It’s more gym space better used, so practices don’t have to go late into the night and the community could actually use the space. It’s improving some of our technical college preparation so we’re not only serving kids who want to go to college but also kids who want to learn a trade. I think it’s a smart investment in the future of our community. We have relatively low taxes already and this is a modest increase. There are actually a number of opportunities to vote early, or you can vote on May 8. The district has all the details about where and when to vote. Of course that’s just my opinion. 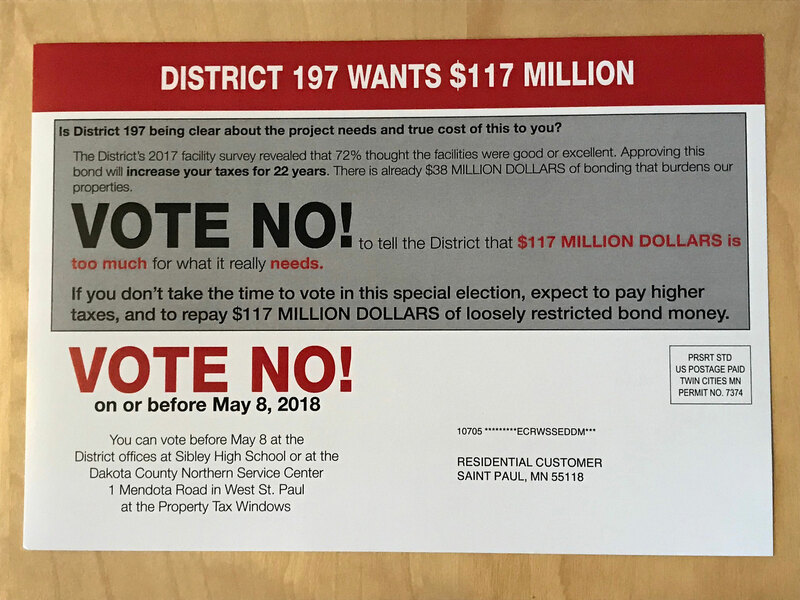 I’ve received multiple pieces of mail supporting the bond, but today I received my first piece of “vote no” mail. The mailer argues that voters should be able to choose what we fund. Yeah, in 2014 the district gave choices about funding tech, security and the football stadium (and the stadium lost). So what? Frankly, if you wanted those choices, we had them in November 2017 with school board elections. The three incumbent candidates ran unopposed. 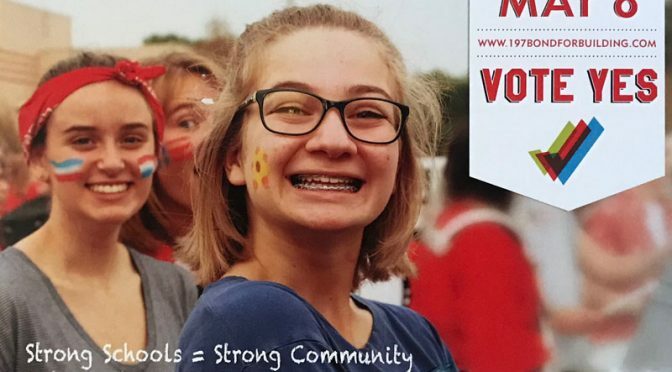 The mailer points to a 2014 levy and says scores are down since 2013, so the district needs to improve academics before we fund “extra-curricular and remodeling improvements”. So how much have high school test scores dropped since 2013? 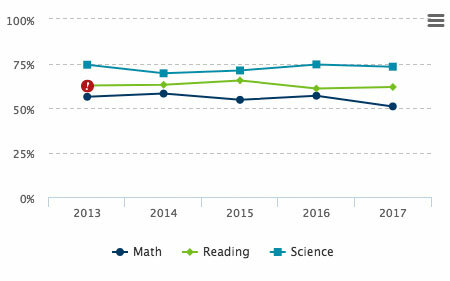 Reading is down 0.8%, science is down 1.1% and math is down 5.4%. The scores actually go up and down every year, so there’s really no downward trend. Yeah, math doesn’t look so good, but it was actually higher in 2016 than 2013. This is a BS argument, cherry picking data that barely helps when you see it in context. If you want to cherry pick data, graduation rates are up since 2013 (by a whopping 0.6%). By the way, how much is the bond going to spend on the “extra-curriculars” they decry? 7% of the bond is athletics and 8% is fine arts, while 56% is academics. The rest is buildings and maintenance. I think they’re focusing on what’s important. A 2017 survey found that 72% thought facilities were good or excellent, so we don’t need to spend $117 million. Having a good school building doesn’t mean it can’t be better. Do we really want a science wing designed in the 1970s? A good enough argument is embracing the status quo and getting ready to slide backward. If we want schools to meet the challenges of the future, we have to invest and prepare now, not wait until our buildings are actually falling apart. Finally, where did this “Vote No” mailer come from? No idea. There’s no organization listed. Nobody was willing to put their name on it. I’m a big fan of transparency and accountability. When I make a mistake on my blog, I don’t just erase it and hope no one noticed. I strike out what’s wrong and correct it. I stand by what I say. When people call me out and challenge what I say, I have a conversation. If I misstated something, I’ll change it. Whoever sent this isn’t willing to extend the same courtesy. That’s wrong. You should stand by what you say and be willing to defend it. Anything else is cowardly. I think our community deserves better than that. Let me just add: If you want to vote no, that’s your choice. Healthy disagreement is fine. But how about we have a real conversation and not hide behind anonymity? How about sharing real data and not cherry picking numbers? I think everything can be better when we have fair, honest, and even robust debate. By the way, the “Vote Yes” mailer I received: “Prepared and paid for by the 197 Vote Yes Committee, 1827 Rolling Green Curve, St. Paul, MN 55118.” Also has a website. And an email address. And a Facebook page. That’s proper transparency and accountability. If you want to know more or research this your self, you can check out ISD 197’s official site and you can check out the Vote Yes Committee information. 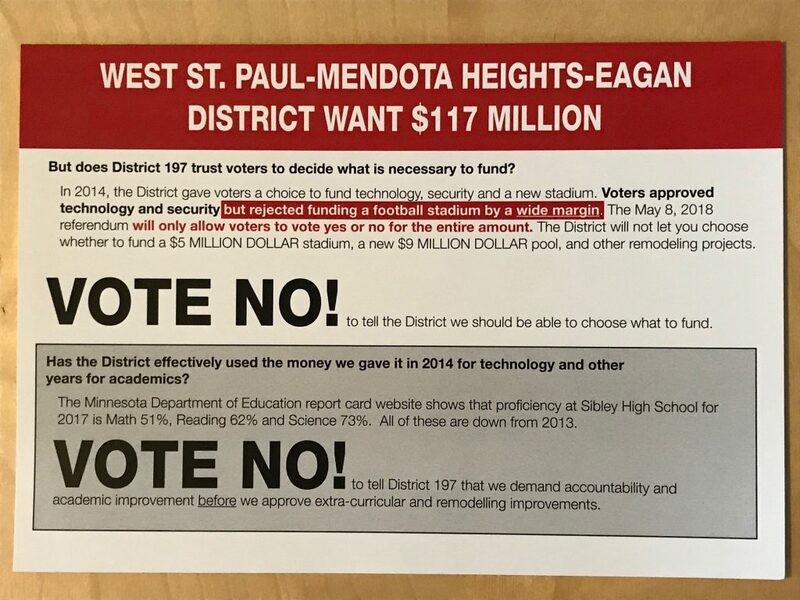 ISD 197 Superintendent Peter Olson-Skog wrote a blog post in response to the “vote no” mailer, so if you want a better answer than I gave, read his post. Mendota Heights resident and bond opponent Frank Pilney … who identified himself as part of the group behind the mailers. State law requires advocacy groups to file a campaign finance report with the school district within 14 days of raising or spending $750 on a ballot issue. Pilney’s group has not done so. Pilney said he didn’t know how much they’d spent on printing and mailers. Asked what he knew of reporting requirements, Pilney said the group was told by the U.S. Postal Service that they did not need to include a disclosure on the mailer. The group wants more accountability and improved academics from the district. It’s a little ironic that a group that wants more accountability passes the blame to the USPS, and wants more focus on education couldn’t bother to learn the law. I’m thrilled to see so many people coming out in support of our schools. Frank Pilney, the organizer of the Vote No campaign, was fined $200 for not including the proper identification and disclosure on their mailer. He blamed the USPS. Previous PostWest St. Paul City Council: Sexism in Appointee Debate?Next PostSexism in Committee Approvals in West St. Paul? Love this clear and straight to the point perspective! State statute 211B.04 (“Campaign Literature Must Include Disclaimer.”) indicates this pretty clearly.